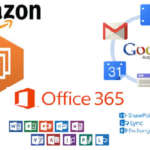 Amazon has announced that it will be launching AWS Workmail to compete with Microsoft’s Office 365 and Google’s Apps product suite. It is planned to release in US East and Europe (Ireland) regions. Price as low as USD 4 per mailbox for 50GB storage. Workmail will also offer migration tools that will migrate email content from Office 365 and might introduce Journaling features in near future. Can it still challenge Microsoft?